It seems that I learn more about exotic musical instruments on the subway than I ever did in all the music classes in college and high school. Kora music remains one of my favorite things to listen to while I code. Recently I’ve encountered a girl playing the weirdest instrument that looks like a mix of a guitar and a grinding organ, but sounds like a mix of bagpipes and violins. As it turns out, it’s an ancient stringed instrument called Hurdy gurdy that hasn’t been very popular since the 18th Century. The performer, Melissa Kacalanos aka Melissa the Loud (blog), is extremely talented. I purchased her CD right there on the spot, and it was the best 15 bucks that I’ve spent in a while. I especially liked “Lucifer Goes to the Circus”, one of her original compositions. I kind of wonder, what “Stainless Steel Worm” would sound like as a song accompanied by Hurdy gurdy. 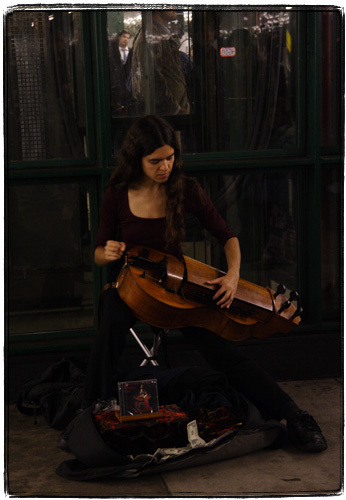 You know, being able to listen to ancient music played on ancient instruments by talented performers once in a while on a subway platform is one of reasons why people pay so much money to live in New York. I am kind of surprized that I haven’t encountered any Chapman Stick or Theremin players yet.